The desert is called Wadi Rum, sweeping and lonely. I imagine Lawrence of Arabia, astride a magnificent Arabian horse, racing over the shimmering sands in a swirling cloud of white robes. In Petra, the ancient “lost city” carved out of rosy sandstone, I imagine Harrison Ford outrunning a gigantic boulder in Raiders of the Lost Ark; heroic, brave, and victorious. This was my second press trip after changing careers and I was ready for the freedom of working in the space of the entire world. The feeling of being a travel writer was intoxicating. The memories are still with me. In an excited and romantic mood, I am on my way to Jordan. However, a feeling of displacement begins shortly after we are airborne. The crew members of Royal Jordanian Airlines are exceedingly cordial, but I begin to feel uneasy surrounded by women passengers cloaked in black. I feel alone and separate; this will be a very long flight. We land in the capital Amman, which is located in the northern part of this ancient kingdom in the Middle East. After an uneventful transfer from the airport and following a solitary dinner in the security of the dining room of the Intercontinental Hotel, I venture out carefully, beginning my explorations of Jordan by examining my immediate surroundings, this very modern, gilded hotel. In the downstairs ballroom I discover a wedding party in progress. I pause at the door and look in like a little girl wanting to join the party, but too shy to ask. An elegantly dressed woman sees me, smiles, and approaches. In flawless English she invites me to join the festivities. The women are splendidly dressed in Parisian haute couture, short sequined dresses in bright red and other fashionable colors. They are dancing, swaying provocatively,a kind of belly dance that is also graceful. In the middle of the room and in the midst of this dance, are a bride and groom. Feeling more at ease and yet not quite sure what an appropriate role for me is, I stand awkwardly to one side observing the dancing and clapping to the beat with the others. The bride and groom now join the dance and the tempo and energy level in the room increase. There is in the room great joy, a sense of community, and an underlying feeling of sensuality. After many dances, the handsome pair are glowing with anticipation. Now quite breathless, they are led by the women to two throne-like chairs, firmly but gently installed in them, and then suddenly the young pair are lifted up in the air by several lusty men who parade them around the room while a high-pitched “yi yi” sound emanates from the women. I too feel the excitement of the moment but not wanting to overstay my invitation, I take advantage of a brief pause in the revelry to offer my best wishes to the newlyweds, and I leave the room. My head is spinning but I have a feeling of wanting more. This initial, intense encounter with Jordanians sets the tone for the enthusiasm with which I will explore this fascinating country. On my second day, I join a group of other travelers and we visit Jerash, one of the best preserved Roman outposts of the world. We walk through the arch erected in honor of Hadrian's visit and down the “Street of Columns.” I realize that I am walking in the tracks left by chariot wheels in 129 BCE. I can visualize the shops of this Roman city bustling with activity. Many lives have preceded me here. Continuing the day's journey, we stop at Umm Qais, one of the 10 cities of the Decapolis Era of the great Greco-Roman urban centers. Called Gadara in the New Testament, it was known as a cultural center and boasted three theatres whose ruins remain today. The spacious outdoor amphitheater in which I find myself we standing alone is now rather unkept and overgrown with grass. But chairs made of granite in a semi-circle appear timeless as if honored guests will soon occupy them. I can almost hear the resonating applause of the audience. We move on, in a southwest direction. Along the way, we stop on the Jordan side of the Dead Sea. I am the only one in the group who chooses to go for a swim at a small sparsely equipped beach area. I wade into the thick water and feel the lumps of salt on the ocean floor. I float serenely in this body of water super-saturated with salt and located 400 meters below sea level. The water feels heavy and thick; its viscous quality is not like any water I have felt. It stings my skin. I swim as if in slow motion in what feels like an amniotic medium. Elsewhere I come upon an establishment where local Jordanians come to submerge themselves in mud baths, which is reputed to be therapeutic. I too partake of the mud, slather some on, wait until it dries to a crackly hardness and then plunge back into the Dead Sea to rinse it off. The mud melts away but my skin is again covered in salty brine. I feel like a well-marinated fowl in some exotic recipe. In Madaba we view the oldest surviving original map of the Holy Land. Located in the Greek Orthodox Church of St. George, it has been created in the form of a Byzantine and Umayyad mosaic, for which Madaba is renowned, and dates back to 560 BCE. Having been buried in sand for centuries, the brilliantly colored map mosaic looks astoundingly new. It is as if time has not passed. Standing at the tomb of Moses on a windswept hill at Mount Nebo, I reflect on where I am. My sense of time, space, and history becomes indefinite, as it does at all of these sites. I also think of the civilizations that have roots here. A general feeling of awe but also a strange kind of humility comes over me. We leave the rural villages of Jordan and drive out into the vast desert of Wadi Rum, the largest and most resplendent in Jordan. Here a breathtaking landscape presents itself. Sandstone mountains rise majestically from the pink sand desert. These are objectives to tempt the most dedicated climbers. Great jutting rocks are foils to the swirling sands that stretch endlessly toward an almost invisible horizon. In the moonscape of valleys and mountains, there is absolute silence. As I adjust my vision to the immense openness of the desert, far off in the distance I see the low-slung black tents of the Bedouin tribes. They are like black inkblots on the shimmering golden sands. When the van stops I get out. I feel a profound solitude. And then I see a dark-robed figure approaching in the distance. I wave. The figure waves back. His approach is slow and sure. And then a dark and leathery-skinned old man scrambles up the rocky cliff on which I am standing. He stops and we look at each other. He puts out his hand for me to shake, and I notice his beaming smile. Like so much I have experienced in Jordan, he has taken me by surprise. It feels now as if he has crossed the enormous distance between us in the blink of an eye. I am stunned. My sense of time is even more disconnected. I smile back at him and shake his hand. Gesturing to my camera, I request permission to take his picture. He assents and I do so. And then, his hand comes out again, this time with the palm up. Suddenly out of nowhere it seems, another Arab materializes. He chastises the old man for asking for money and in gestures apologizes to me. I reciprocate as best I can, turn away, and get back into my car. I continue to drive across the desert feeling increasingly out of time. Far off to my right I spy the fabled ships of the desert; a string of camels moving slowly and rhythmically across the sea of sand. 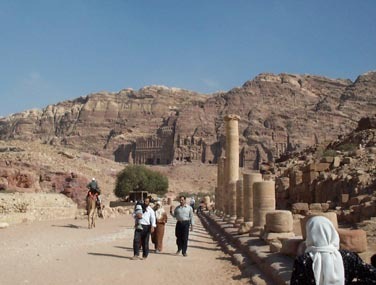 Petra, our final destination awaits us. We pass through the desert on our way to this legendary site. Suddenly I spot some shepherds in white cloaks shearing sheep. I call to the driver to stop and I get out and approach the shepherds to take a picture. With gestures, they ask if I would like try shearing a sheep. While my colleagues watch, I do so clumsily. All brown-teeth smiles, the shepherds get a real kick out of my ineptitude. Bowing my thanks to the shepherds, I get back into the van where I am greeted either by smiles or glares. I make a quick assessment as to who my friends will be on this trip. We arrive at Petra and I walk up the gravely path where enormous rock formations formed a crevice called the Siq. I then climb into a rickety, two-seater horse-drawn carriage and we bump down a winding path for about a mile. My ambitious colleagues choose to walk. Overhanging cliffs of Nubian sandstone almost meet 300 feet above us. The ride is so unsteady that the carriage nearly topples over twice. Maybe I should have walked. From within this giant crack in the earth, I see a slit of bright light far in the distance. We round another curve and there it is: the most spectacular, awesome sight I have ever seen, the Treasury of Petra. I climb on a camel and begin my journey through this amazing city. My colleagues again choose to walk and I am disappointed in their lack of adventure. However, camel riding is not as easy as it may look. The camel kneels down so that I can climb on, but when he stands up, I quickly grip the animal’s mane to prevent me from tumbling over his head. The camel drivers laugh hysterically at my whoops and hollers. 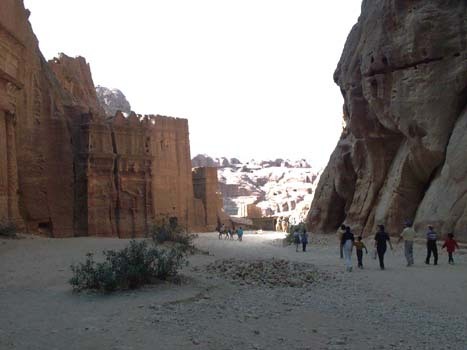 I venture off alone to explore the secrets and splendors of Petra: cavernous temples, elaborate tombs, a theatre, baths, markets, banquet halls and monuments. An elderly Bedouin woman invites me into her home to see her display of rocks. Tumbling off my camel, I climb up into her cave, which I discover is actually a two-bedroom apartment. The bright natural light penetrating from the outside reveals the many colors of the cave walls. I select a few rocks as souvenirs and pay the woman. Climbing back down, I encounter Nancy, a member of our group, and I offer her a ride on my now spitting camel. Disgusted, she declines. My camel and I however take no offence. When we return to the parking area, the rest of the group is waiting at the van where they are enthusiastically exchanging stories. Without a doubt, this is the highlight of the trip; we have come to a place that has existed since ancient times. It is as if time has been suspended and we have been transported to a separate reality. Three miles down the road we come to Tabet Zaman, our rest stop. The van pulls up to a sprawling, open-air adobe and stone structure in the desert. It is now dark and we are shown to our private bungalows. Mine is two rooms separated by an arch. The entrance room is a sitting room with a couch (with TV and phone), and the second room is sparsely decorated but with a queen-size bed. Its beige and chocolate earth tones give it a warm cozy feel. I walk outside into the dark, cool air and follow the path to the Sahtain buffet to meet the group. We join the buffet line passing giant black cauldrons steaming with foods we cannot identify. I recognize beans and rice so I take a little of everything. I ask a few in the group if they would like to explore this place with me. Nancy is too tired, Jacqueline says no, Sara wants to pray, and the others look blankly at me. So I say my “g’nites” and I set off to see what I can see. I wander into the taboun (bakery) and buy a pastry from the baker, a short man with a long beard. He explains that Tabet Zaman was once a 19th century village that was renovated to provide accommodations and facilities for guests. It still has the appearance of a typical Jordanian village of that era. He emphasizes that I should not miss the Souk or the Turkish Bath and points me in the right direction. It is a moonless night and I hear loud howling; ghostly in the silent desert. Stopping to listen, I also hear braying: wolves and donkeys. I feel strangely unafraid; something about the place comforts me. I find my way to the Souk (market) through the village square. In this African bazaar: long tables are piled high with hand-made souvenirs, embroidered dresses as well as gadgets and rocks from Petra. A delightful scent leads me to the spice shop. Lined up neatly throughout the store, burlap sacks stand four feet high, and contain a myriad of fresh and colorful spices. It suddenly dawns on me that I am also well along one of the oldest trade routes in human history. I am in the middle of the spice trade. I can hear exotic music somewhere nearby, so I follow the sound to a very small, dimly lit club crowded with men in headdresses puffing on hookahs, the traditional water pipe. To the accompaniment of the Middle-Eastern music a belly dancer with long black curls and a shimmering green costume with bells on it, moves around the tables. Her dance is sultry. Being the only woman in the club besides the belly dancer, I feel somewhat self-conscious, but my curiosity is stronger. I sit down at a long table next to some Arab men. One smiles at me and offers me a puff from his hookah. I give it a try and find it very mild, more like steam than tobacco. When she finishes her dance, the belly dancer offers everyone a milky drink. It makes me feel even more relaxed. I nod good night to everyone, and walk to the Turkish Baths. At the baths, Arabic music is playing softly and I hear the trickle of water. A boy about 12 years old dressed only in brown shorts, leads me silently by the hand to a stone stall where he hands me a towel to put on. After a few moments, he returns to pour a bucket of warm water over me, and then leads me to another room. Here, he motions me to lie on the stone floor. I wait. Then a very handsome man with only a towel around his hips, enters the small room. We don’t speak. He reaches for soap and a loofah and begins scrubbing my arm. The floor is so slippery that I begin to slide away. He grabs my ankle and pulls me back. After scrubbing the parts of me that he can without offending either my decency or propriety, he pours pitchers of warm water over me. He then begins to give me the most soothing massage I have ever had. When he finishes, the young boy wraps me in warm towels from head to toe and leads me to yet another room where I listen to high-pitched Arabic music and sitting on a very tall stool, I sip tea. I am now in a complete and deep state of relaxation. The next morning, I tell the others all about my late night experiences. Some say I was crazy for going out alone. Some don’t believe me. Others look at me oddly. I, however, know first-hand what they missed. 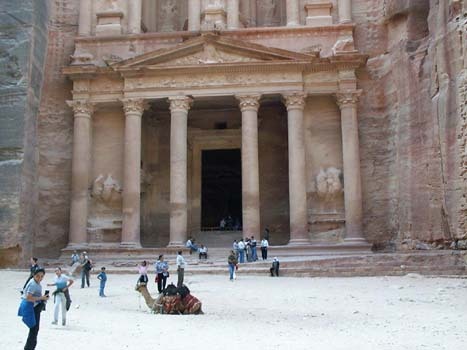 Visit the Jordan Tourism Board of North America, an excellent site that suggests itineraries, accommodation, and also has downloadable PDF brochures. See especially the webpage on Wadi Rum. You can also access flight information on Royal Jordanian Airlines by clicking on the previous link. An excellent personal website for fits-hand information information on Wadi Rum is Walter Neser's Wadi Rum Rock Page. The Lonely Planet's article on Wadi Rum is also worth reading. More stunning photographs of Wadi Rum can also be seen on the TrekEarth website. 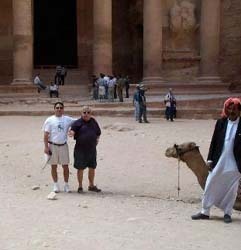 And if you visit Petra and happen to see our Talking Travel host doing a site inspection, don't be surprised. He's been known to pop up almost anywhere.